One of the main risk factors for COPD is smoking tobacco. In fact, it is very rare for a non smoker to develop COPD. 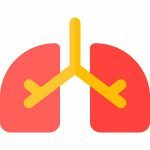 A rare genetic condition known as alpha-1-antitrypsin deficiency can cause COPD.